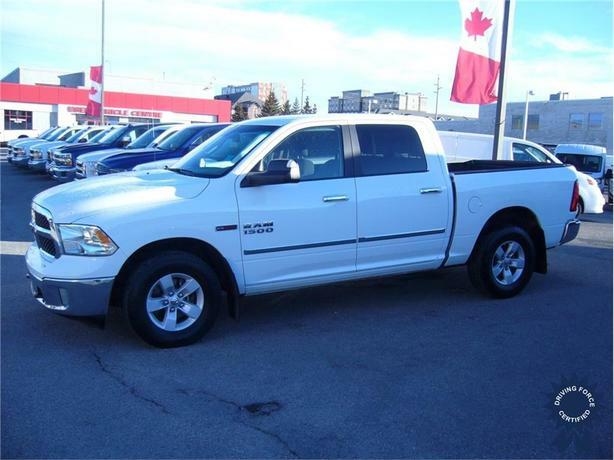 This 2016 Ram 1500 SLT Crew Cab 6 Passenger 4X4 5.7-Foot Short Box Truck comes with a 140.5-inch wheelbase, 8-speed TorqueFlite automatic transmission, 3.92 rear axle ratio, 17-inch X 7-inch aluminum wheels, bight white exterior color, diesel grey/black premium cloth front 40/20/40 split bench seat (seating for up to 3 passengers in front seat), black power/manual fold trailer tow mirrors, ParkView rear backup camera, Uconnect 8.4-inch SiriusXM satellite capable radio/hands-free system, media hub with SD/USB/AUX input jack, 6-speakers, 160-amp alternator, auto locking hubs, chrome door handles, power rear window, deep tinted glass, chrome grille, tip start, manual air-conditioning, cruise control with steering wheel controls, two 12V DC power outlets, rear defrost, fog lights, power drivers seat, spray-in bedliner, trailering package with integrated trailer brake controller, 115V power inverter, remote USB port (charge only), tire specific low tire pressure warning system, clean CarFax vehicle history report, 2 sets of keys, balance of factory warranty, and has been certified to our high standards with a 120 point inspection, 1,630 lbs Maximum Payload, and GVWR rating of 6,950 lbs (3,152 kgs). The 3.0-litre EcoDiesel V6 engine provides 240 horsepower at 3,600 RPM and 420 lb-ft of torque at 2,000 RPM. Touch base with us to discuss purchasing or financing options that are right for you and experience the difference you will only find at DRIVING FORCE Vehicle Rentals, Sales and Leasing.